Below is a description of the types of Sustainability Awards given each year. To see this year’s winners, click here. Sustainer: This award will recognize a chef who has been both a great mentor and is a model to the culinary community through his/her purchases of seasonal, sustainable ingredients and the transformation of these ingredients into delicious food. 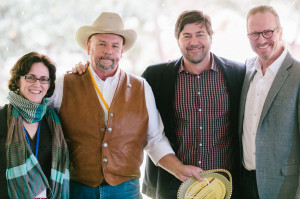 Pathfinder: This award will recognize a visionary working in the greater food community who has been a catalyst for positive change within the food system through efforts that go beyond the kitchen. Foodshed Champion: This award will recognize a food producer (farmer, fisher, artisanal producer) committed to working with chefs and who exemplifies the following principle: Good food begins with unpolluted air, land, and water, environmentally sustainable farming and fishing, and humane animal husbandry. Pioneers Table: Established in 2010 to recognize individuals who have made longstanding and exemplary efforts in transforming the sustainable food landscape – The Pioneers Table honorees – selected by the Chefs Collaborative Board, are true sustainable food pioneers who broke with tradition early on to pave the way for legions of chefs and culinary professionals.